How to change ringtone on iPhone or set custom ringtone in iOS 11 on iPhone X/8/7/6S/6/5S? Read this guide to get your answer. Downoad AnyTrans for iOS to add custom ringtones to iPhone 4/4s/5/5s/6/6s/SE/7/8/X from MP3, WMA, WMA, WAV, M4R and M4A on your Mac/PC computer. 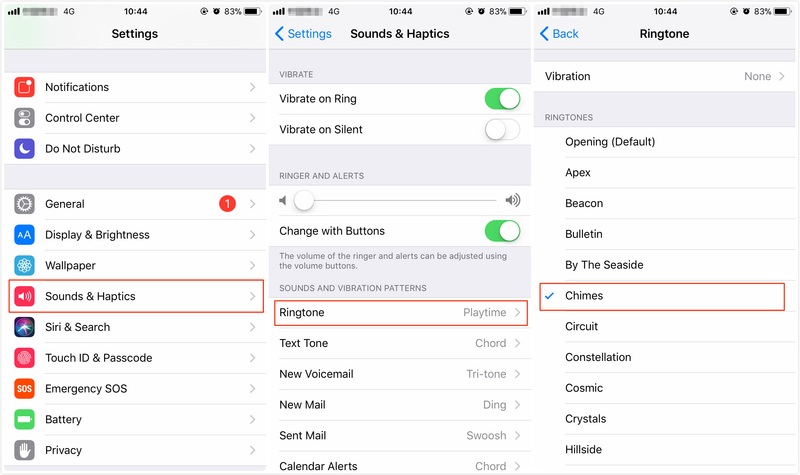 Here in this guide we will show you how to change ringtone on iPhone, and also tell you how to set custom ringtone on iPhone without iTunes. Let’s get it on. Step 1. Go to Settings > Tap Sounds & Haptics > Tap Ringtone. Step 2. Here you will see your current iPhone ringtone > Choose the ringtone you prefer, and tap it to change that. In old time, if you want to change a custom ringtone on your iPhone, you just need to purchase from iTunes store by tapping the Store button in the top right corner. But now, the latest iTunes version – iTunes 12.7 has removed Tone and App features. That’s to say, if you have updated to iTunes 12.7, then you will have no access to buy, make, transfer and delete ringtones via iTunes. Lots of iOS users complained about this change. In response, Apple quietly released iTunes 12.6.3 to bring back the Tone and App tab. But it is worth mentioning that Apple provides no technical support for this version, only for iTunes 12.7. It is not the officially recommended version by Apple. 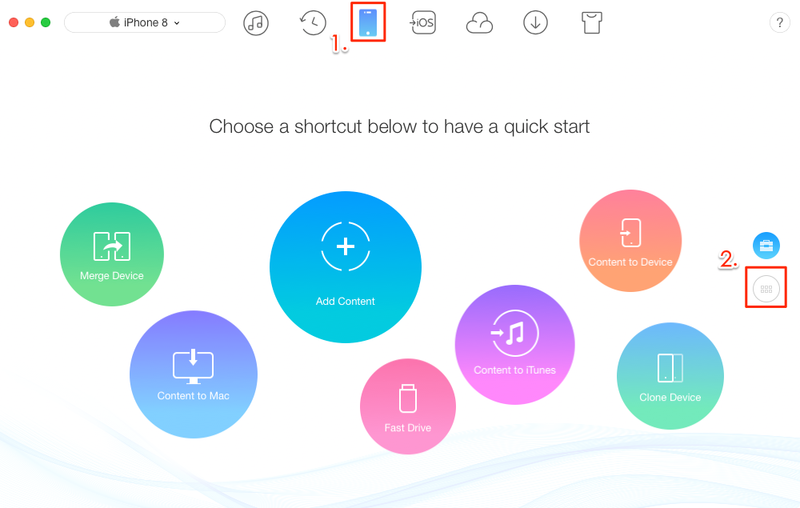 Also, many users reported that when they downgrade from iTunes 12.7 to 12.6.3, they have to fix the iTunes Library.itl cannot be read problem, or the process will failed. To help you avoid those hassles and easily change custom ringtones on your iPhone, in the next part we will show you how to change ringtones on iPhone without iTunes. If you want to change ringtone on iPhone without iTunes, then you can’t miss AnyTrans for iOS. It is one easy-to-use iPhone file manager that can help you transfer songs to iPhone as ringtone in 1 click. 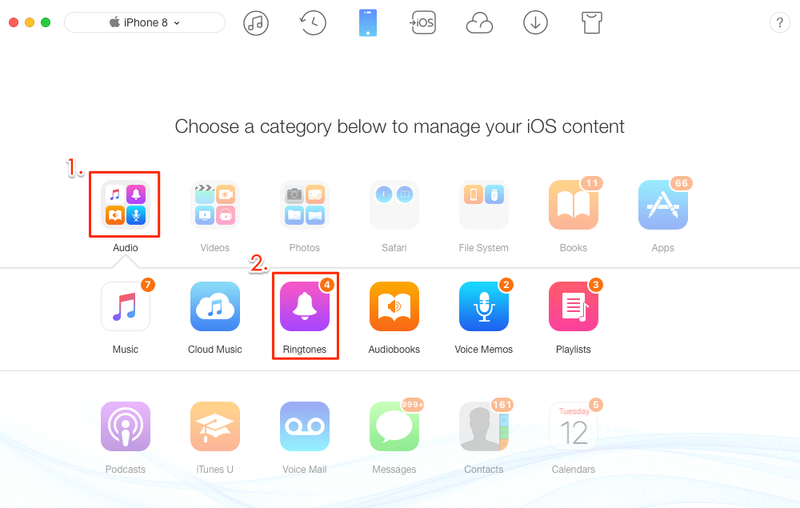 All you need to do is select and transfer the songs or other audio files you like to iPhone, and then they will be converted to ringtones on your iPhone automatically. And it also allows you to keep the ringtone for 25 seconds, 40 seconds, or the original length. Now let’s follow the simple steps below to set a custom ringtone. Step 1. Download and install AnyTrans for iOS on your Windows/Mac computer, and connect your iPhone to it. Click on Device tab on home of AnyTrans for iOS, and then go to the category page. Step 2. Scroll down, click on Audio button, and choose Ringtones. Step 3. 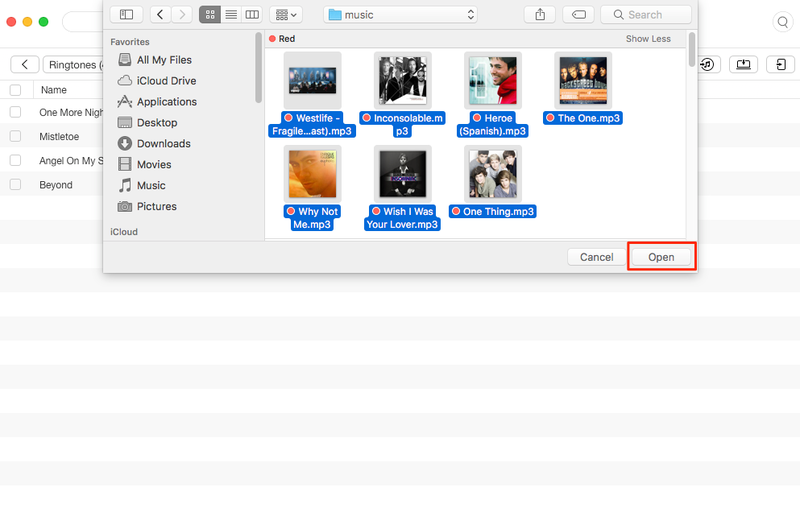 Click the “+” button on the right hand corner, browse the song you want to set as ringtone from your computer, click the Open button to start transferring. That’s all for how to change ringtone in iOS 11 on iPhone X/8/7/6S/6/5S. AnyTrans for iOS can also help you transfer music, photos, videos and more, so why not download it to better manage your ringtones as well as other types of iOS data on iPhone? Please be free to let us know if you have any questions on this guide or AnyTrans for iOS.